DFCCIL Admit Card 2019:- Download Junior Executive Admit Card from Official www.dfccil.gov.in Portal of Dedicated Freight Corridor Corporation of India Limited(DFCCIL) will conduct an online MTS, Executive and Junior Executive post Exam. DFCCIL MTS, Junior Executive & Executive’s 2019 Written Exam Date is confirmed by the Official in October 2019. The official will release Admit Card 2019 for the upcoming Central Government Executive Exam DFCCIL. See www.dfccil.gov.in for details on DFCCIL 2019 admit card download for JE(Junior Executive). The examination is beginning to fill up 1527 vacant DFCCIL department posts. Get dfccil admit card 2019 download link below and also the important instructions to know before appearing for the written exam. 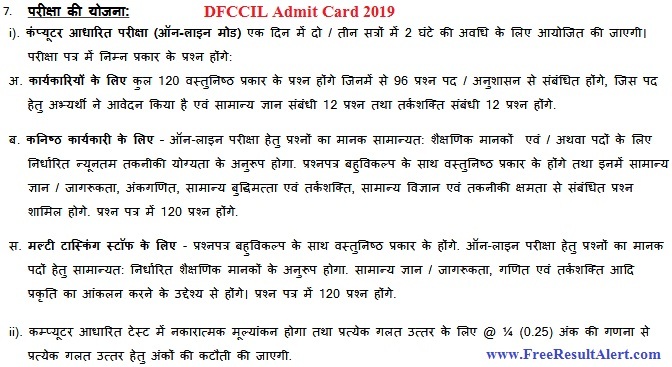 1.3 How to Download DFCCIL Admit Card 2019? The online application round will take place in August. The official www.dfccil.gov.in 2019 will upload their admit card to all the students who were shortlisted through an online application. All students who are preparing the syllabus & pattern of the official MTS & Junior executive exam need to show excellent performance in the 2019 exam. Students can download the call letter from Jr. executive & multi-tasking staff with their application no. or user Id. Candidates who will be selected in the written test commencing from October. will be selected for further rounds. At the end of this article, the download link of the DFCCIL admit card is given. Students can find all necessary details written on the admit card only. The online DFCCIL admit card 2019 is E-admit card only. Students will only be permitted with their prints. We wish All the best to students and on behalf of our team, we hope that all students score really well. More updates will be posted soon and students will only be able to receive updates for the DFCCIL MTS recruitment at the Free Result Alert. At the time of examination, candidates must carry the printout of the DFCCIL hall ticket together with a Photo ID Proof. Note:- If any student is unable to download the hall ticket then they can use the below-given link else share your issue with us by commenting down below. How to Download DFCCIL Admit Card 2019? Go to the Official Website of Dedicated Freight Corridor Corporation of India. There, Scroll Below Down at the “DFCCIL News“. Find & Click on the “Admit Card for the Post of Executive, MTS & Junior Executive Advt. No.11/2019“. On the Next Page, Fill the Required Asked Details. Finally !! Your Dedicated Freight Corridor Admit Card of DFCCIL for Executive, MTS & Junior Executive Post will Appear at Your Screen.